The bountiful beauty of grapes is not only appealing to the eye, but to the palate as well. Grapes are sweet, crisp, and refreshing. Known as the key ingredient for making different varieties of wines, grapes come in all different shapes, colors, and sizes and have flavors ranging from sweet to sour. Most grapes are members of the Vitis vinifera family although there are other varieties, as well. Seeded grapes tend to have more flavor, but most people prefer to eat seedless grapes. Most of the calories in grapes come from carbs. There are about 27 carbs in a single serving of the fruit. Most of that is sugar (just over 23 grams) and just over one gram is fiber. If you are following a low carbohydrate diet, keep in mind that each single grape contains about one gram of carbohydrate. When eating grapes, aim to keep your portion to about 12 to 15 medium grapes, equivalent to a half cup serving. The glycemic index of grapes is estimated to be about 59, while the glycemic load is estimated to range from 5 to 11 for a one-cup serving. Grapes are a nearly fat-free food, providing far less than one gram per serving. There is just over one gram of protein per serving of grapes. Grapes are a excellent source of vitamin K and manganese. You'll also benefit from a healthy dose of vitamin C when you eat grapes. Grapes are a sweet, very low-fat, relatively low calorie treat. If you are trying to reduce your processed food or added sugar intake, grapes can be a good substitute for other goodies like cookies, candy, or treats. Grapes can also be part of a weight loss diet. Most of the health benefits of grapes come from the vitamins that they contain. Vitamin K is important for strong bones and blood clotting. Note, if you take coumadin or blood thinner, your vitamin K intake should be consistent. Vitamin C helps to keep immunity high and aids in repairing tissues, such as wound healing. B-vitamins are an important factor in metabolism, and in maintaining strong hair and nails. In addition to being a good source of vitamin C and K, grapes contain relatively large amounts of phytonutrients, especially flavonoids, such as resveratrol (found highest in the skins of red grapes). Resveratrol has antioxidants, which may help to lower the risk for high cholesterol, high blood pressure, blood clots, and heart disease. It is found in the skins of deep-purple, red, and black grapes, making these varieties a richer source of antioxidants, as opposed to green grapes. Some research indicates that high intakes of resveratrol can also help to improve memory and cognitive function in older adults. Grapes also contain quercetin (a flavonoid found in apples), which may help protect our cells from damage. There is some evidence of reduction of cancer and heart disease risk from these compounds. Are white-coated grapes safe to eat? Grapes that have a powdery-white coating are safe to eat. In fact, that coating is actually referred to as bloom, a naturally occurring substance that protects grapes from moisture loss and decay. Sometimes it doesn't wash off easily, but it is safe to eat. What are some of the different varieties of grapes? Grapes, either European or American variety, are grown in the United States. 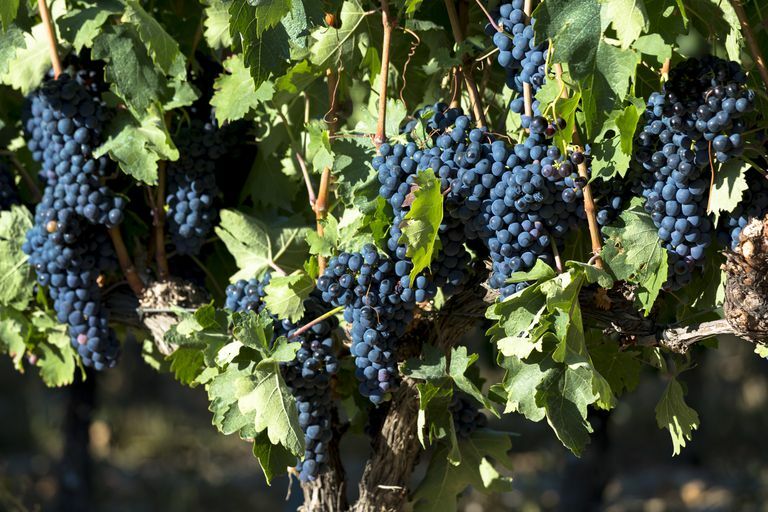 European grapes are harvested in California, mostly for making and drying raisins, while American grapes are mostly used in making jam, jelly, juice, and other food products. There are many varieties of table grapes, ranging from white, black, green, and ruby-red. What's available in the grocery store depends on the time of year. Some examples include Adora, Almeria, Beauty Seedless, Crimson seedless, Concord, Emperor, Niagra (white concord grapes), Red Flame, Ribier, Ruby seedless grapes, Scarlotta, Thompson Seedless, and more. Each variety of grape has a distinct flavor. Do nutrition facts for grapes change based on variety? No, nutrition differences between varieties aren't substantial. What is the best way to choose grapes when purchasing? When purchasing grapes, avoid grapes with mold or those that are shriveled. Choose grapes that are rich in color. Green grapes are the sweetest and best flavored when they are yellow-green in color. Red and black grapes are best when they have full, rich color. How should I store grapes to keep them fresh? Inspect the exterior: Check for signs of mold, shriveling, or poor stem attachment. Any grapes with these signs are likely to deteriorate faster and affect the others. Discard any grapes that may not be in good condition. Keep them cold: Grapes keep best if they are cold. Place them near the back of the refrigerator (the coldest place) and away from pungent foods such as onions as they have the ability to absorb odors. Keep the original package: Keeping grapes in their original container will prevent them from being squished. In addition, the container they were put in typically has the right amount of covering and ventilation to help extend shelf life. Store them unwashed: Like many fruits, grapes should be stored unwashed. Washing prior to storage can promote moisture which can speed up the decaying process. Instead, rinse your grapes right before consumption. You can freeze them too: To get even greater use from your grapes, freeze them to use later in a smoothie, in cocktails, or even as a cool, refreshing snack. Grapes are best known for being eaten as a snack, one-by-one. Their sweet, juiciness acts as a basis for a wonderful snack. Grapes can also add twists to salads and compliment the saltiness of assorted cheeses and olives for an appealing appetizer. Lastly, grapes can be used in making desserts or simply cut up in fruit salads. Grapes are likely safe when consumed as food, although eating grapes may slow blood clotting so medical experts advise that you don't consume large quantities of grapes prior to surgery. Berkeley Wellness. Types of grapes. Retelny, Victoria. The colorful truth about anthocyanins complex compounds with many potential complex powers. Food and Nutrition. 2016;16-17.